It’s been a while since I’ve added to this blog. I’ve been busy interviewing amazing teachers for my new podcast (shameless plug warning) – The Amazing Teacher Podcast. This does not mean, however, that I’ve stopped my journey toward school administration mastery. I wanted to share a lesson that I learned recently about communication. As an administrator, I’ve learned that communication is very important. You have to communicate effectively with parents and teachers and students and others, but a lot of times, I found that the focus is on communicating to others and not so much on being communicated to. What I learned recently is that it’s equally important to give the opportunity for teachers to communicate to us. Instead of just top-down communication, we need to also focus on bottom-up communication. I remember as a teacher, even though I had many opinions and ideas for my administration, I never shared them. Well, I did share them, but to my other teachers, and it was more as a complaint. I would have gladly shared my amazing insights on school policy and procedures, but I was never asked. I guess they were waiting for me to volunteer my suggestions, and I was waiting to be asked. Whether it was true or not, it appeared that there was no desire on the part of administration to listen to the teachers. Instead, this lack of bottom-up communication led to gripe sessions and a creation of an us-versus-them environment between the administration and teachers. This is not what I want my administration to be known for. This lesson was eye-opening for me. What is keeping us from just asking? Is there anything that you have heard that we should be aware of? What is your opinion on the new policy that we’ve implemented? I’m sure you can think of other questions. The hard part is your response to their answer. When we try and justify our actions, we dilute the power of just asking. 1. You give value to the opinions of those who you need to implement your vision. 2. You demonstrate a desire to work together with the teachers to move the school forward. 3. You break down barriers between the administration and teachers. 4. You can learn where there are weaknesses in the school. 5. You send the message that teachers are an important part of the school community. I wonder sometimes if some administrators have a subconscious belief that teachers are not as smart as they are, and therefore, there is a hesitation to just ask. Whether this is true or not, this message is delivered with the decision to not ask. Yes, administration is a completely different world than teaching. I’m learning this every day. Still, I believe teachers can provide some very valuable advice on how to move the school forward, if only we make the decision to just ask. 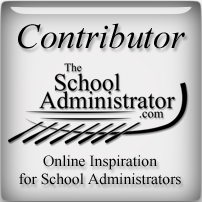 Do any of you experienced administrators have a system in place to get feedback from teachers? Here’s to your journey toward School Administration Mastery!